From your selfie obsessed sister to your silly office mate, a tech gadget or accessory makes a great gift for everyone on your list. 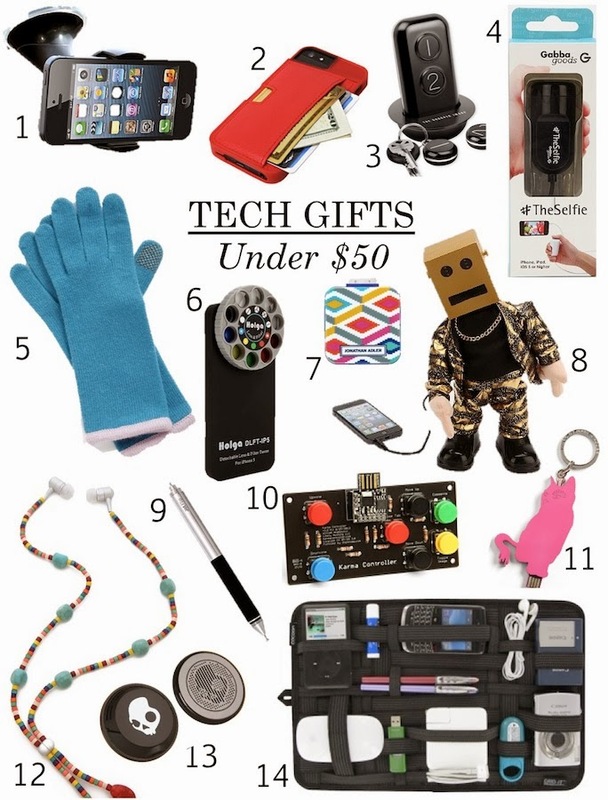 Check out these fun tech gifts under $50 and f you have a bit more to spend, check out my cool tech gifts for guys and tech gifts for her. 1. iOttie Car Mount Holder $17 - Help them go hands free with a convenient car mount! 2. Q iPhone Card Wallet $40 - The perfect item to help minimize things to carry and keep track of. I'm getting one for my guy and one for myself! 4. Gobba Goods the Selfie $20 - Know someone that never met a bad selfie (at least in their mind)? This iPhone remote is sure to be one of their favorite gifts of the holiday. 5. Portolono Tech Gloves $38 - Cozy cashmere blend gloves with tech-friendly finger tips are must haves for cold weather! These come in 9 rich colors. For men, check out these. 6. Holga Lens & Filter iPhone Case $30 - 10 special effects filters make iPhone photos one of a kind with this rotating holga case. 7. Jonathan Adler iPhone charger $28 - Never run out of batteries with a colorful backup iPhone charger. This has saved my battery life over and over again! 8. Dancing Robot Portable Speaker $40 - Get your groove on with a dancing portable speaker. A great gift for jokesters or those that log hours at their desks. 9. Jot Flip Stylus & Pen $35 - Have someone in your life that complains about typing on an iPhone? This stylus is the answer - and it has a pen as well for convenience. 11. Marc by Marc Jacobs Flash Drive key chain $48 - A great gift for students, this cute flash drive will help them take their keys and homework with them on the go. 12. Hand Candy Samba Headphones $44 - Help her look fashionable and tech savvy with lightweight earbuds (with built-in microphone) that have a necklace like cord. 13. Smith Optics Helmut Headphones $23 - A perfect gift for snowboarders, the Direct Connect Audio speakers fit in all helmets so they don't have to miss a beat on the slopes. 14. Coocoon Innovations Grid-it Organizer $30 - For the organization lover and/or the frequent traveler, the Grid-it has a place for every personal electronic and fits into a laptop case for ease. I'm laughing so hard at "The Selfie," but at the same time, I really want to try it out.